“World Toilet” was a trending topic on Twitter today – a great success in social media, because a trending topic is a keyword or a combination of words on Twitter which are most often used during a given time and appear in a list of the 10 most often used keywords on Twitter. With Twitter being the de facto live indicator in social media with a world wide audience, this may indeed be regarded as a success. Right here in Germany, over 100 students from schools in Berlin together with the German Toilet Organization (GTO) drew the attention to the current situation in Haiti and reemphasised the importance of adequate sanitation. Haiti is currently experiencing a cholera epidemic which has already claimed over 1000 lives. Cholera is caused by substandard sanitation and hygiene. 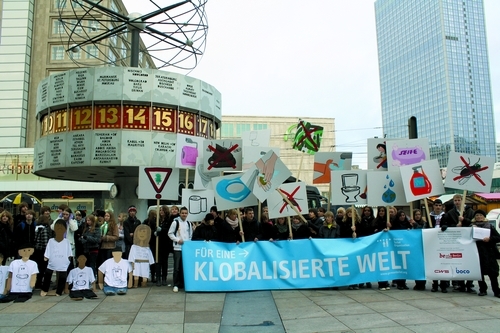 Together with the German Toilet Organization (GTO), these youngsters protested at Berlin’s Alexanderplatz for a “Toiletised World”. With artistically designed toilet seats, bush toilets and other creative ideas, the students made their presence felt. The German Federal Minister for Development Dirk Niebel applauded the students’ commitment to the World Toilet Day. Niebel explains that water and sanitation improvements remain a central focus of German international development work and goes beyond the current situation in Haiti. “Sustainable sanitation is essential, especially for children in order for them to grow up healthy and take part in education” the Minister stressed. “It is in schools where the foundations of behavioural changes in terms of hygiene and sustainable resource use are laid“. Remember, World Toilet Day is celebrated on November 19 every year, and since EVERY HUMAN BEING HAS TO DEFECATE AND URINATE, a World Toilet Day affects all of use, rich and poor, sick or healthy. So kudos to the World Toilet Organisation, Jack Sim and his dilligent team, for campaigning on- and offline & pushing the World Toilet Day on the international agenda! 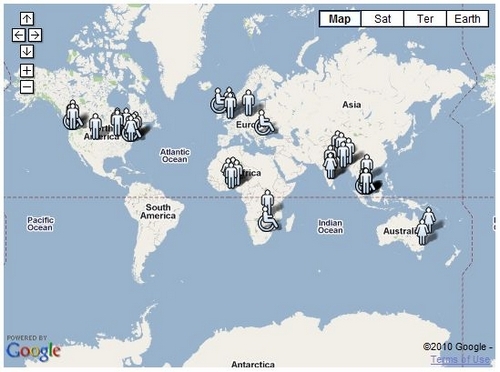 Disclaimer: WTO, GTO and WECF are all partners of the Sustainable Sanitation Alliance.